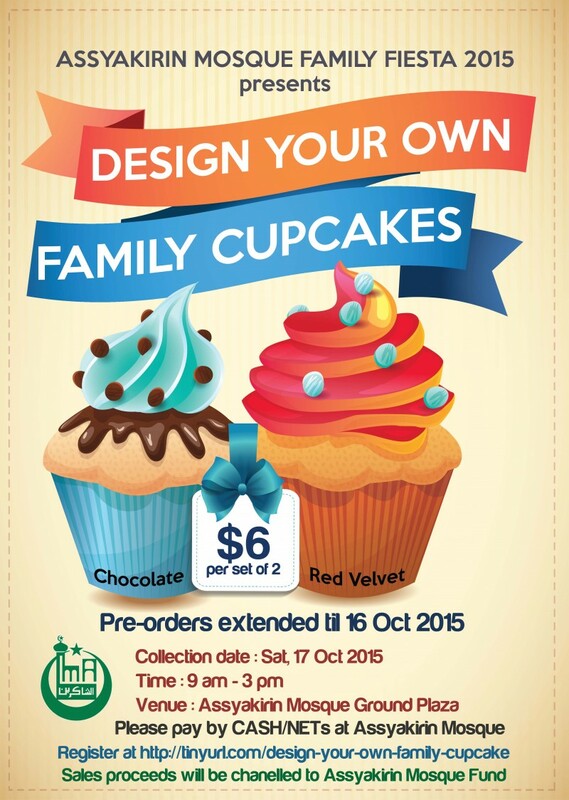 If you think you are good at making cupcakes, this will be a good time to design and create your own cupcakes for the family! 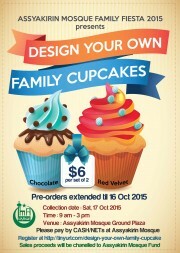 DESIGN YOUR OWN FAMILY CUPCAKES! $6 for a set of 2 (chocolate and red velvet). Set includes buttercream & cream cheese frosting and sprinkles for you to decorate with your family members on the spot! Collection on 17 Oct 2015 between 9 am and 3 pm. All sales proceeds will be channeled to the Mosque Fund. d) Un-redeemed cupcakes will be sold off after 3 pm and the proceeds will be channeled to the Mosque Fund.